Rangerettes in the midst of their kickline. Halftime has just begun and Lakewood’s very own Rangerettes are about to show off their high kicks and bright smiles. The Rangerettes accompany Lakewood’s Marching Band at all of the home and away games. Currently there are sixteen girls on the team with three captains: Jillian Moorman, Stephanie Posedel, and Audrey Stahl. These three young ladies work with the Rangerette advisor, Kristen Tellaisha, to choreograph all of the halftime routines. The team this year has a skill set that seems to be more well-rounded, leading them to be able to input more difficult moves in the dances they perform. “The greater the skill set, the greater our confidence,” said Stahl. From early morning practices, to evening rehearsal, the team meets to perfect the show for Friday nights. 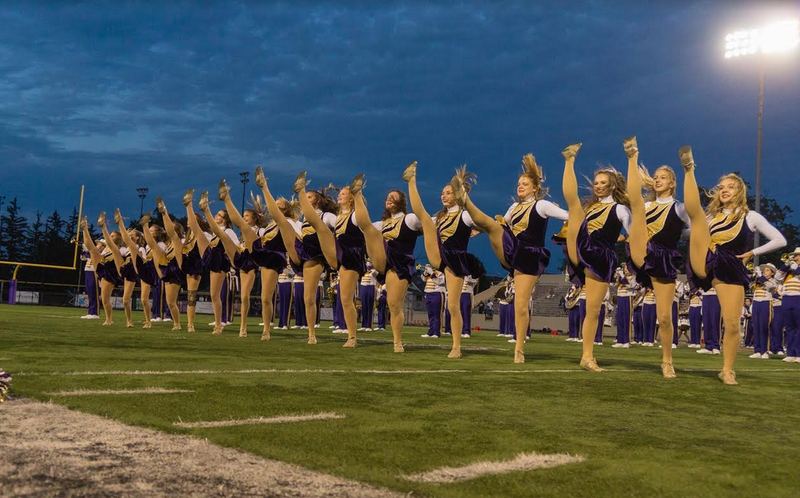 When not debuting their intense kick line, the Rangerettes are chanting in the stands with the band– cheering on Lakewood’s Football team. The process to become a Rangerette is not an easy one. In the April before the season starts, tryouts are held. For four days, anyone can come to clinics to learn two routines: a kickline and a detailed dance. Then, at the end of the week girls are split up into groups to perform what they learned to a panel of judges. That day it is determined who has made the team– a very nerve-racking day to say the least. The Rangerettes do more than just dance on the field during halftime, they also spend quality time together after games. The bond between the girls on the team is irreplaceable. So, next time you are at the game seeking some extra entertainment, catch the Rangerettes halftime show!